Leeds Harvest Days Celebration will be held June 21-23 in 2019! Please spread the word! 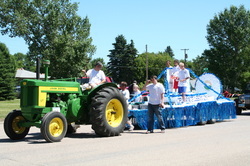 Harvest Days is a community celebration held each summer. 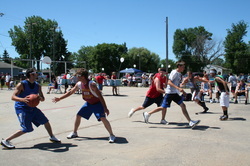 Annual events are a 5k run/walk, pool games, demolition derby, parade, kickball tournament, kids carnival, street dance, 3-on-3 basketball tournament, steak fry, and a community breakfast. Other events held at times are a vendor fair, crazy relays, trap shoot, sand volleyball, paint ball, and a golf tournament. Harvest Days has become an event people look forward to each summer as a way to display our community pride and celebrate our community spirit.